By any standard, Palenque is a magical place. I have visited several times and expect to return. Its natural setting on the well-watered littoral between the highlands of Chiapas and the coastal plain of Tabasco is striking. Its fabled ruins are as impressive as those from any ancient culture on the planet. Palenque is the high water mark of Maya civilization, and the Maya were the most advanced of all ancient Americans. 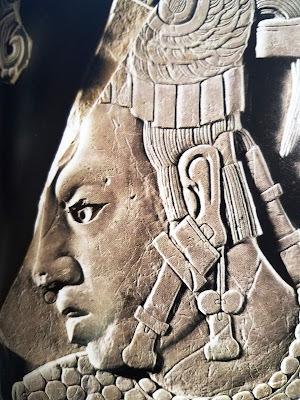 K'inich Janab Pakal (AD 603 - 683) was a grand king and the discovery of his intact tomb beneath the Temple of the Inscriptions in 1952 is often considered the greatest archaeological discovery ever made in the Western Hemisphere. Modern Mayan decipherment began in earnest at the First Palenque Roundtable in December, 1973. George Stuart and his wife, Gene (1931 - 1993), celebrated National Geographic authors, attended that noted gathering. Soon afterward they took their young son, David, to Palenque where he began working with Linda Schele (1942-1998). David was 12 in 1978 when he presented a paper at the Third Palenque Roundtable. By age 18 he was the youngest-ever recipient of a MacArthur Fellowship. He earned his PhD from Vanderbilt, taught at Harvard, and now holds the Linda and David Schele Chair at UT Austin. David Stuart is generally regarded as world's leading Maya epigrapher. George and David Stuart wrote Palenque Eternal City of the Maya published in 2008 by Thames & Hudson. 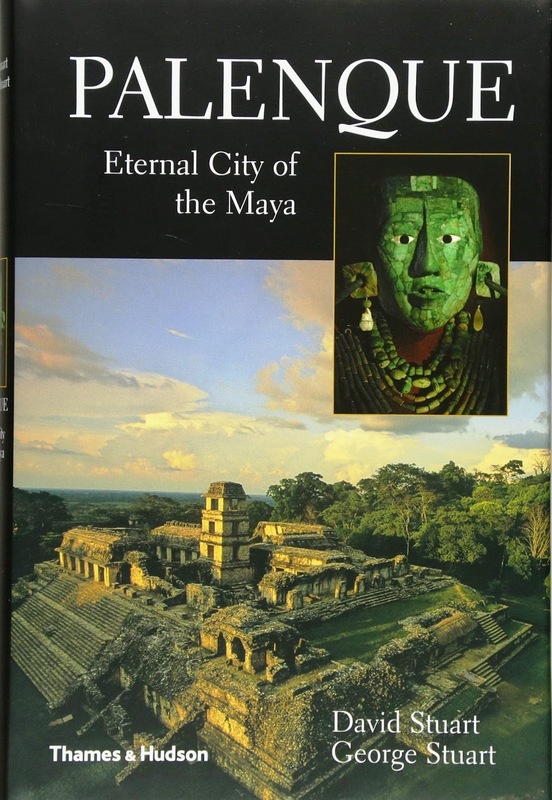 Excellent Book on the "Queen of Maya Cities"
I read it looking for potential Book of Mormon connections. This article highlights what I found. Palenque p. 33 Earliest known occupation at the site was 500 BC. This fits Nephite or Mulekite time horizons. Palenque pp. 35-63 detail the publication history of early reports and drawings of the site. 1808 Domingo Juarros described the ruins in a Guatemalan publication printed in Spanish. 1810 Alexander von Humboldt included a drawing of one panel from Palace House A in a European publication printed in French, but he mis-identified this artifact as Oaxacan. 1814 an English translation of Alexander von Humboldt was published in London. 1822 Antonio del Rio's 1787 report to the Spanish crown was published in English translation in London with 17 drawings of Palenque monuments. The popular London Literary Gazette gave it a harsh negative review. 1823 del Rio's report was printed in German translation. 1827 8 illustrations from the 1822 publication were included in a new work printed in French that compared primitive North American mounds with much more advanced Palenque structures. 1827 The Saturday Evening Post published a letter describing Maya hieroglyphic writing. 1829 James H. McCulloh published ten pages of serious discussion about Maya writing including the first images of Maya hieroglyphs printed in the Americas. 1830 Lord Kingsborough shared a great deal of Palenque material including dozens of drawings in his monumental Antiquities of Mexico published in London. A copy of this important work finally reached the US in 1839. News of Palenque was just beginning to appear as Joseph Smith was growing up in New England and New York. After the young prophet's theophany in 1820, the pace of information flow quickened. See the article 1829 for more historiography about who knew what when. Palenque pp. 107-108 describes a site called La Esperanza (aka Nueva Esperanza) on the west bank of the Usumacinta near the modern town of Emiliano Zapata (formerly Monte Cristo). It was one of the oldest and largest among the many preclassic sites in the region studied by Robert L. Rands. It has been only lightly sampled archaeologically. It was occupied ca. 300 BC. It is the premiere example of a strikingly different cultural pattern than the contemporaneous early Maya civilization Richard Hansen is working on in the Mirador Basin. El Mirador and nearby preclassic sites in the northern Peten were clearly precursors of the classic Maya with temples atop pyramids, public art, standardized iconography, and glyphic writing. La Esperanza and other preclassic sites like it in the western Maya area were populous but relatively plain architecturally and artistically. 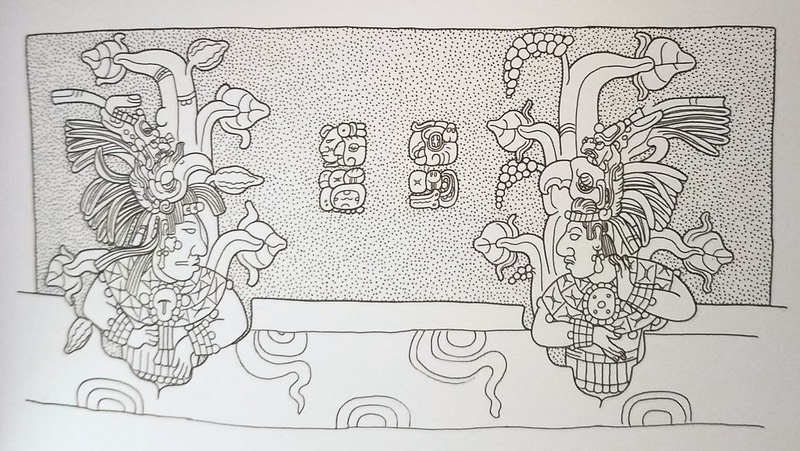 Stuart hypothesizes that classic Maya culture reached Palenque from the Peten rather than from the much closer La Esperanza. In Stuart's view (following Rands) Nueva Esperanza and similar sites were something of a cultural anomaly surrounded by proto-Maya on their way to becoming classic Maya. I visited La (Nueva) Esperanza in 2006 with Garth Norman acting on a suggestion from John Clark. Locally it also goes by the names Zapatillo and Calatraba. It features dozens of mounds, some quite large. A couple of mounds had been sideswiped with a backhoe for sampling. We did a little surface scavenging. Garth believed the shards we found were preclassic. Garth and I correlate Nueva Esperanza with the city of Zarahemla on the west bank of Sidon. In his 2005 Worlds of Joseph Smith presentation at the Library of Congress, Clark's title slide was an image of Nueva Esperanza. The town of Emiliano Zapata (Monte Cristo) is mentioned on pp. 18-19, 82, 89, and 108. Palenque is strategically situated between the Michol river flowing west and the Chacamax flowing east. Emiliano Zapata is at the confluence of the Chacamax with the Usumacinta. 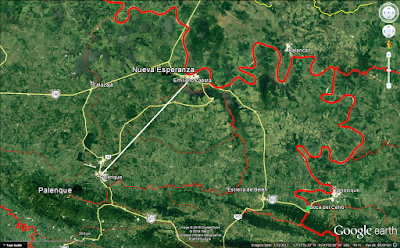 The Usumacinta is navigable to Boca del Cerro upstream from Tenosique, but Emiliano Zapata is only 35 air kilometers from Palenque while Tenosique is 60 air kilometers distant and on the other side of the big river. 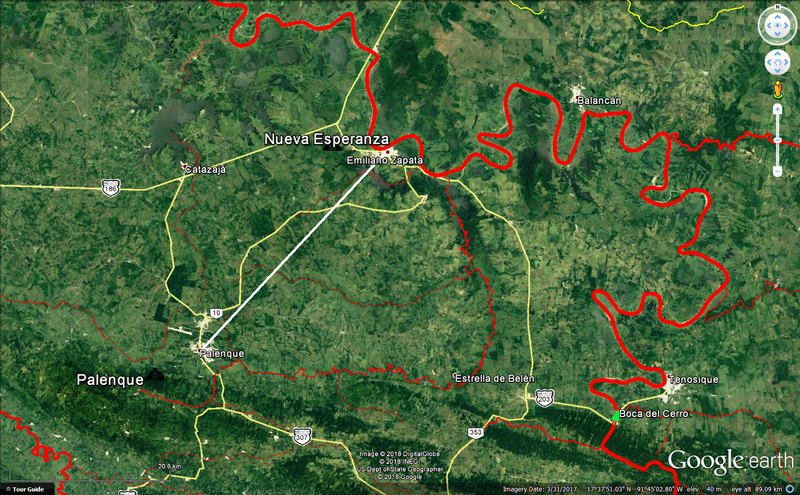 An ancient trail, early dirt road, and modern paved road all connect(ed) Emiliano Zapata (Nueva Esperanza) with Palenque. 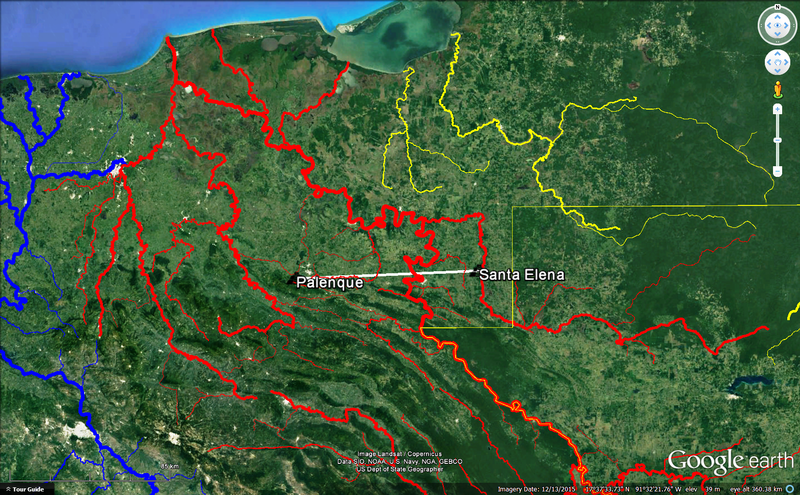 This is the most direct route from Palenque to the sea. Nueva Esperanza is the point along the Usumacinta where permanent downstream flood plain gives way to higher arable ground. 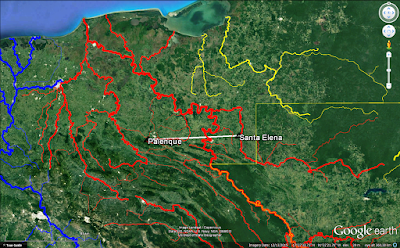 Immediately NW of Nueva Esperanza lie the formidable Pantanos (Swamps) de Centla full of jaguars and crocodiles which Garth and I correlate with the wilderness of Hermounts Alma 2:37. In this model, Palenque is in the lesser land of Zarahemla and Boca del Cerro is the point on the route to the land of Nephi where lowland Zarahemla gives way to upland wilderness Omni 1:27-28. Palenque p. 18 describes 588 meter El Mirador peak with the Cross Group at its base and a small ruin at its summit. Norman correlates this eminence with hill Manti Alma 1:15 and I follow his lead on this point, having found no better candidate. Palenque p. 82 reports that as late as 1897 the official inspector of ancient monuments for the Mexican government did not know if the major site Yaxchilan was in Mexico west of the Usumacinta or in Guatemala east of the river (it is on the Mexico side). This is an indication of how difficult and inaccessible the upper Usumacinta area is. Even today, a trip to Yaxchilan is a travel adventure because there are no roads to the site. The Book of Mormon describes a scenario where the Nephites in Nephi (Kaminaljuyú in our correlation) and the Mulekites in Zarahemla (Nueva Esperanza on our map) were completely unaware of each other's existence for nearly 400 years Omni 1:14. The Book of Mormon also describes multiple savvy groups getting lost in the wilderness between Nephi and Zarahemla Mosiah 8:8, Mosiah 22:16. Both the disorientation and incommunicado narratives fit well in our proposed correlation where one goes through the upper Usumacinta basin to travel between Nephi and Zarahemla. See the articles "Water Fight on the River - Round Four" and "Water Fight on the River - Round Five." Palenque p. 98 - 103 tells the fascinating story of Mayan decipherment. Many of the people mentioned have connections to the LDS Mesoamericanist community. Books that once belonged to Tatiana Proskouriakoff (1909-1985) are in my personal library. David H. Kelley (1924-2011) was John L. Sorenson's friend and collaborator. Michael D. Coe was in Utah in 2015 as Richard Hansen's guest. See the article "Hansen and Coe." Gordon Willey (1913-2002) was one of the three founders of the New World Archaeological Foundation (NWAF) along with Thomas Stuart Ferguson (1915-1983) and Alfred V. Kidder (1885-1963). Román Piña Chan (1920-2001) was one of the five people digging near Huimanguillo, Tabasco in 1953 as part of NWAF's first field season. The others were Pedro Armillas (1914-1984), William T. Sanders (1926-2008), Gareth W. Lowe (1922-2004), and John L. Sorenson. See the articles "Zarahemla ca. 1955" and "Gareth Lowe's Maps." George W. Brainerd (1909-1956) would have been John L. Sorenson's PhD advisor at UCLA had he not died unexpectedly just as Sorenson was beginning his program. Robert M. Carmack is the brother of John K. Carmack, emeritus General Authority, and the uncle of Book of Mormon textual scholar Stanford Carmack. Linda Schele (1942-1998) was Allen J. Christenson's PhD advisor at UT Austin. Christenson, on the BYU Humanities faculty, is a Mayanist who specializes in K'iche'. Palenque p. 102 talks about the Grolier Codex which recently joined the Dresden, Paris, and Madrid Codices as an authenticated pre-Columbian Maya manuscript. The Grolier is different enough from the other three that most scholars initially dismissed it as a fraud. John L. Sorenson in a 1997 article entitled "The Sobering Lesson of the Grolier Codex" uses the Grolier's journey from pariah to pillar as a cautionary tale about those who would cavalierly disregard the Book of Mormon as an ancient American codex. Palenque p. 105 reminds us that less than two percent of Palenque has been studied in depth and there is much yet to discover. 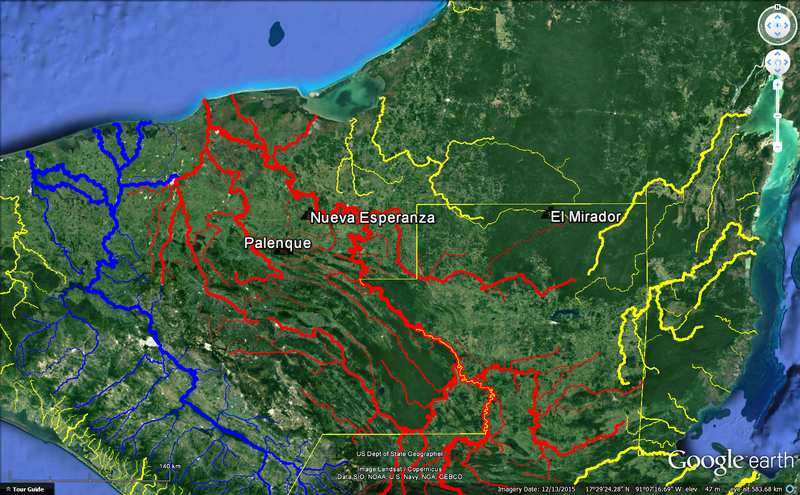 National Geographic just published a report on Richard Hansen's LIDAR project in the northern Peten. The survey shows 60,000 structures previously unknown to science (many, unfortunately, already looted). Ancient population in the area may have reached 15 million. There is much yet to discover. See the article "LiDAR." Palenque p. 109-110 discusses a very early Palenque ruler (perhaps mythological) who was born on March 11, 993 BC, well into Jaredite times. Another ancient leader began to rule in 252 BC when the Nephites were still living in the city of Nephi. 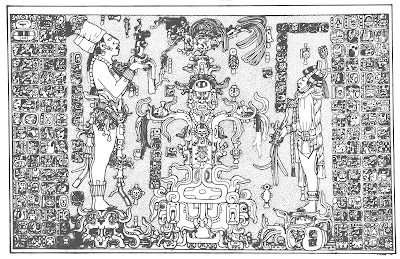 Palenque p. 114 shows the earliest known depiction of a Palenque ruler and he is heavily bearded. Stuart calls him the "Ch'a" ruler born in AD 422 and comments on his unusual hand gesture pointing downward. We have seen this gesture before on Kaminaljuyú Monument 65 and Izapa Stela 5. See the article "Partake of the Fruit" for illustrations. 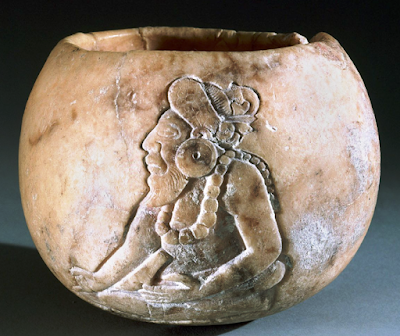 The inscription on the bowl calls him a "young" ruler even though his full beard implies age. This reminds us of Mormon's play-on-words description of Alma1 in Mosiah 17:2. See Matt Bowen's 2016 Interpreter article entitled "Alma - Young Man, Hidden Prophet." Palenque pp. 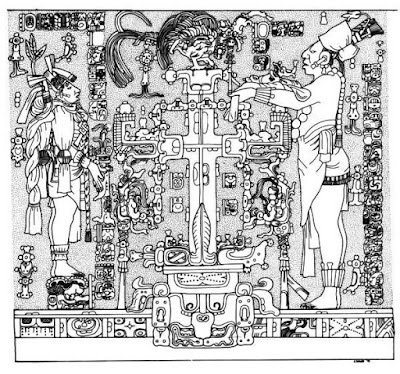 117, 138-9, 145, and 149 reproduce David Stuart's very clean drawings of 7 ancestors carved into the walls of Pakal's sarcophagus. Each is depicted as an anthropomorphic fruit tree. This is interesting because of the curious Book of Mormon teaching in Alma 32 that humans can sprout trees. 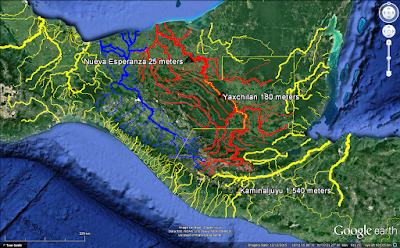 See the articles "Maya Place Names" and "Anthropomorphic Trees" for context. Another anthropomorphic plant is depicted on the Tablet of the Foliated Cross where heads appear as corncobs on a stylized maize plant. Palenque pp. 143-4 explain how the Maya used variants of the term "seat" to describe a ruler's accession to the throne. The Book of Mormon follows this same convention Alma 4:17. Palenque pp. 145, 178-9 discuss the phrase "enter the path" used commonly at Palenque to mean a ruler died. On p. 178 Stuart gives a new translation of the rim text from Pakal's sarcophagus lid. It has a list of royal ancestors who "entered the path" on such and such a date. The Book of Mormon equivalent is "go the way of all the earth." Lehi would soon go the way of all the earth in 2 Nephi 1:14. Ditto King Benjamin in Mosiah 1:9. Mosiah2 had already gone the way of all the earth in Alma 1:1. Ditto Teancum in Alma 62:37. Chief Judge Parhoron (critical text orthography) had gone the way of all the earth in Helaman 1:2. The phrase "go the way of all the earth" is also biblical. Joshua used it as recorded in Joshua 23:14, and King David harked back to Joshua's words in 1 Kings 2:2. Some of the Bible versions shown on biblehub.com use the word "path" or "road" rather than "way." Palenque pp. 148, 238 discuss the chiastic pattern found in the dynastic king list from Palenque. There is a chiastic pattern found in the dynastic king list recorded in the book of Ether. See Book of Mormon Central KnoWhy #235 "Why Does the Book of Ether Start with Such a Long Genealogy?" People come up with wildly different notions of the distance a Nephite may have traveled in a "day's journey." I take the Book of Mormon phrase to be a standard unit of distance measure, and some of the best textual scholars in the Church support this interpretation. See the article "Textual Progress." It is helpful to know from historical records how far pre-modern groups actually traveled in one day. Palenque p. 158 reports a narrative with details that allow us to calculate distance traveled per day. On August 7, AD 659, troops from Palenque captured the king of Santa Elena in his hometown. Six days later they paraded this same king as a bound captive before K'inich Janab Pakal in Palenque's palace. How far did this military detachment travel in six days with a high-value captive in tow? 95 air kilometers divided by 6 days equals 15.8 kilometers per day. This compares remarkably well with other journeys we have documented. See the article "Land Southward Travel Times." Our rule-of-thumb standard unit of distance measure - 15 air kilometers per day - is corroborated yet again. 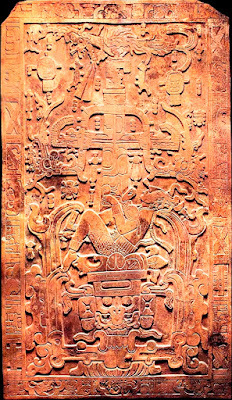 Palenque p. 174 is describing the famous resurrection scene on Pakal's sarcophagus lid. It mentions circlets that represent jade and preciousness scattered throughout the image. Many have pointed out that these circlets are fruits of the stylized tree depicted in cruciform shape above or growing out of the king who is being re-born. Stuart comments (Palenque p. 176) on the rows of jade beads adorning the flowers of the tree. Similar circlets representing fruits of the tree are a prominent motif on Izapa Stela 5. See the article "Partake of the Fruit." The Book of Mormon explicitly associates trees and fruit with resurrection Alma 32:41-42. An incised circlet appears in front of the upper lip and under the nose of K'inich Ahkal Mo' Nahb in a fine portrait on Temple XIX's limestone panel. This is what Mesoamericanists typically call a "breath bead" which represents life and re-birth. Many breath beads are illustrated in the article "Partake of the Fruit." Dead bodies were sometimes interred with small jade breath beads near the deceased's nostrils. The Book of Mormon explicitly associates breath with life Mosiah 2:21. Palenque pp. 176, 198 share the name the Maya gave the stylized cruciform image of their sacred world tree. They called it "Shiny jeweled tree." Stuart also uses the term "jade jewel tree." Jade beads represent fruit of the tree. In addition to dominating the scene on Pakal's sarcophagus lid, this special tree is the central motif on the Tablet of the Cross, now in the Museo Nacional de Antropología in Mexico City. 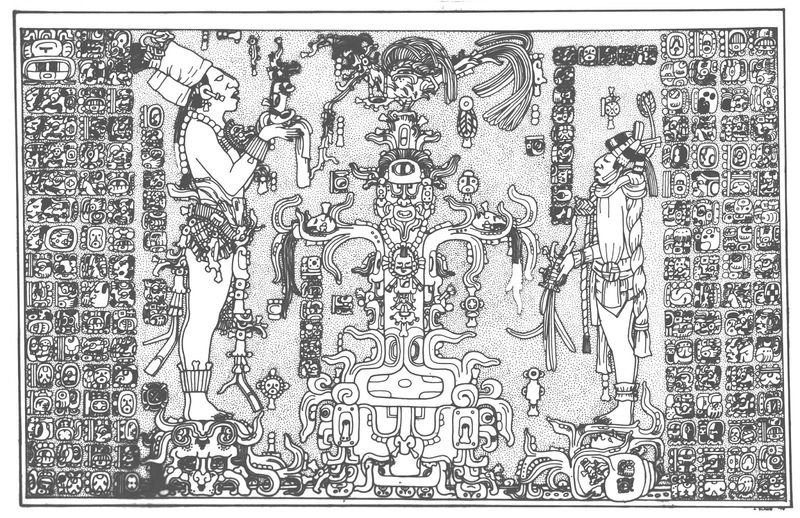 Palenque p. 192 Stuart downplays the Popol Vuh's role as an urtext for classic Maya religion. 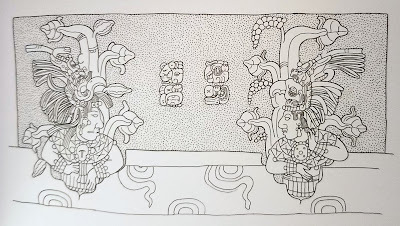 He stresses that the Popol Vuh story elements appearing iconographically throughout the Maya area are few and scattered. 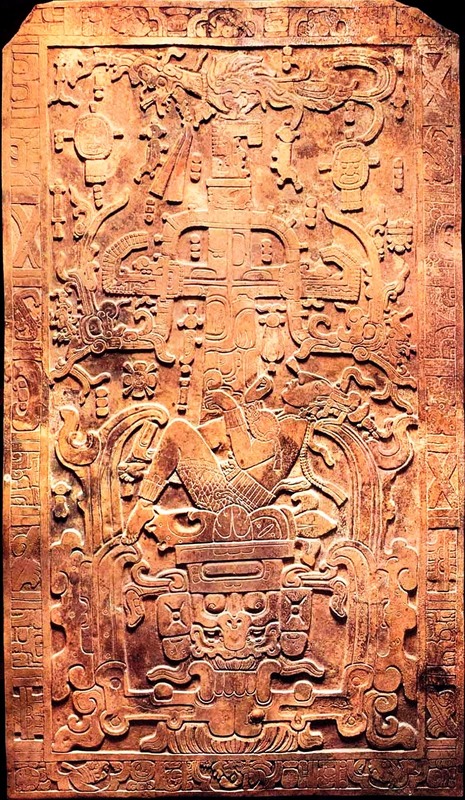 We reached this same conclusion regarding Popol Vuh imagery on Izapa Stela 25 "Art and Iconography 2" and Izapa Stela 5 "Art and Iconography 4." See also the Stuart's discussion in chapter 8 note 10. Palenque p. 223 talks about the title sajal applied to military captains. Alma 2:13,16 attests military captains among the Nephites as Alma 43:6 does among the Lamanites. Palenque p. 228 describes Matwiil, legendary origin place of the Maya, as watery and symbolized by cormorants which are coastal birds. 1 Nephi 17:5 and Ether 6:2-4 describe watery, coastal places of origin. See the discussion of pp. 72-73 in the article "Maya Place Names." Palenque chapter 8 note 15 (p. 256) has a tantalizing clue for those of us interested in locating Book of Mormon lands. The Maya knew where GI descended from heaven and they had a name for the place - "six sky." The Book of Mormon tells us that the resurrected Savior appeared to the Nephites at "the temple which was in the land Bountiful" 3 Nephi 11:1. This article was written by Kirk Magleby who volunteers as Executive Director of Book of Mormon Central, world's premiere source of reliable Book of Mormon contextual material in English and Spanish.